A newly built community of 20 tiny houses is serving as transitional housing for Yuba County, Calif.'s homeless population. 14 Forward may be unlike any community you’ve heard of. It’s a cluster of 20 tiny houses designed to house Yuba County, Calif.’s homeless population as they transition into more permanent housing, local TV station KCRA reports. The 12 by 8 foot homes, which are modified Tuff Sheds, have just two single beds and insulation. There is no plumbing or electricity, according to the Sacramento Bee; however, a nearby building called the Twin Cities Rescue Center provides residents with food and showers, with portable toilets present around the site. The county used $100,000 of taxpayer money as well as many contributions from charities and corporations to fund 14 Forward, according to KCRA. The community took about six months to build, according to The Daily Mail. 14 Forward’s residents started moving in on July 15, according to Sacramento, Calif. TV station FOX 40. It’s a big change for many of the community’s residents, who had been living in encampments along rivers surrounding Yuba City and Marysville, Calif., the Bee reports. "One thing about being out here, there's a certain kind of freedom. There's no pressure to make money to pay bills you're not accountable to anybody," Bobby Clyde-Wells, who has lived in the Horseshoe area of the Yuba River Flood Plain for four years, told FOX 40. The initiative has inspired Sacramento City Council members to voice support for a similar community of tiny houses for homeless people in their city, the Bee reports. 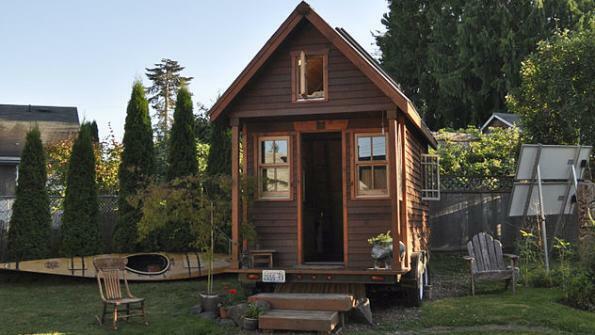 Meanwhile, Los Angeles officials have been on a quest to take tiny houses away from homeless people in the southern part of the city after receiving complaints from locals, according to the LA Times. “I’m getting complaints from constituents who have to walk in to the streets to avoid them,” City Councilman Curren Price told the Times. Los Angeles Mayor Eric Garcetti’s spokeswoman, Connie Llanos, told the Times he has made a commitment to get permanent housing and other services for the city’s homeless populace. But Elvis Summers, a former homeless person who built the houses, said it’s a better option for people living on sidewalks.